As thousands of police attacked the square, opposition leader Vitali Klitschko urged civilians to defend the protest camp; at least 10,000 heeded his call amid fires and exploding stun grenades, the AP reports. CNN reports that protesters fashioned a makeshift compressed-air cannon and stockpiled weapons last night, transporting stones from hand to hand, building Molotov cocktails, and fueling fiery barricades composed of wood and tires. The EU and Germany are among those calling for calm, while the governments of France and Poland got more specific: They're calling for "quick and targeted sanctions against those responsible for these acts." Reuters reports that Francois Hollande wants to see them imposed as soon as tomorrow, at an EU meeting of foreign ministers. Meanwhile, Russia called the chaos the "direct result of connivance by Western politicians," Reuters finds. After late-night talks between President Viktor Yanukovich and opposition leaders failed to yield any compromise, the president issued a statement calling for opposition leaders to draw a "boundary between themselves and radical forces which are provoking bloodshed." 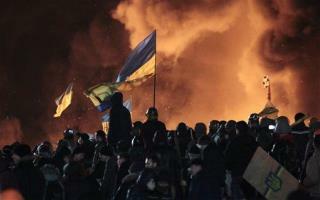 The opposition leaders said that Yanukovich's only proposal was for the demonstrators to go home. Ukraine's Olympic committee said in a statement that it was "shocked" and "doing our best to honor (loved ones back home) on the fields of play here in Sochi. We appeal for peace and mutual understanding, to find a positive way forward for Ukraine." Meanwhile, the IOC rejected the Ukrainian delegation's request to wear black armbands to honor the dead, notes the AP. Corsica and watashiwa, you have no idea what your talking about, and your comments are revolting. Why don't we just burn the constitution while we're at it. Sometimes I regret ever reading the comments. This is what we should be doing here in the US against this fkd up administration we have.